Wed., Apr. 25, 2018, 12 – 1:30 p.m. In December 2015, Leon McCarron set off from Jerusalem to walk 1000 miles through the heart of the Middle East. The five-month-long journey took him through the rolling green hills and terraced olive groves of the West Bank; the deep chasm-like wadis and ancient kingdoms of Jordan; and vast, rugged deserts of the Sinai Peninsula. Along the way Leon walked on a series of new and audacious hiking trails in the region, collecting the thoughts and stories of the people that he met, and exploring the rich past, tense present and uncertain future of the region. He also looked at how contemporary borders and checkpoints have affected the land and its peoples, and the role of walking as a possible way to make divided lands feel whole again. 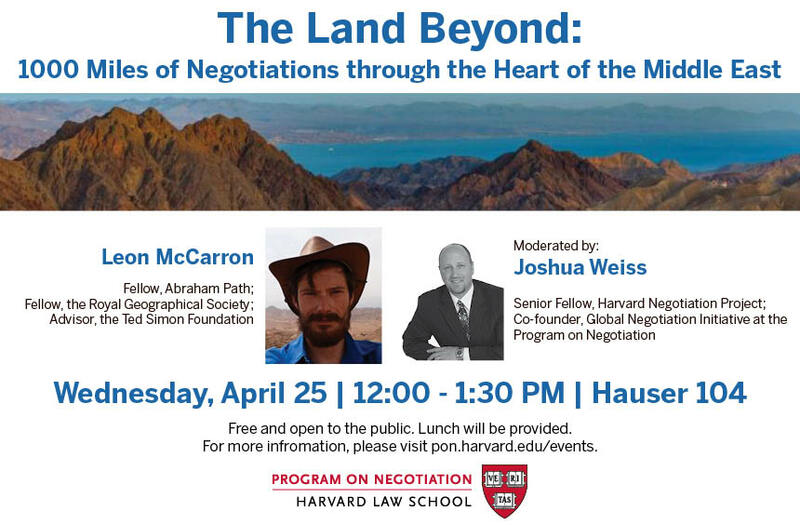 Working on the premise that the brain works best at 3 miles per hour, this talk will explore the various layers of culture, history, faith and politics at work in the bubbling cauldron of one of the most complex and compelling places on earth – the Holy Land.